Water Testing for Cyanuric Acid | Palo Cedro Pool & Spa, Inc. The swimming season is just around the corner and if you haven’t already, you want to begin to get your pool in top order so you will be ready for the swimming season. Today’s tip is to begin the season by getting your water professionally tested. Most companies do not test for Cyanuric Acid; you might know it better as the product Stabilizer, so when getting your water tested request it EVERY TIME YOU GET YOUR WATER TESTED! Ideally, one wants to have at least 30 ppm of stabilizer in a pool and not be higher than 50 ppm. At above 50 ppm of cyanuric acid, the time it takes to kill bacteria in the water is longer compared to swimming pool water without cyanuric acid. Also, as the level of cyanuric acid builds up, the chlorine will become increasingly less effective in keeping the water clean and problems such as increased cloudiness occur. Pools above 100 ppm need to be drained of about 20% of it’s volume and fresh water needs to be added. Caution: One never wants to drop more than a foot of water at a time and then add fresh water, keeping your water level up. 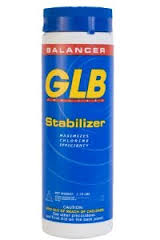 Keep in mind that your tabs, granular chlorine and some shocks have stabilizer in them. When using a shock most of the time you want to make sure you are using a shock that does not have stabilizer in it. And, for those really hot days, instead of adding to your float a bunch of tabs, keep on hand a case of liquid chlorine. The tabs can’t keep up or dissolve fast enough anyway to keep up with the amount of lost chlorine on those hot days so just dribble some liquid chlorine in each morning and your pool will stay beautiful all summer long.